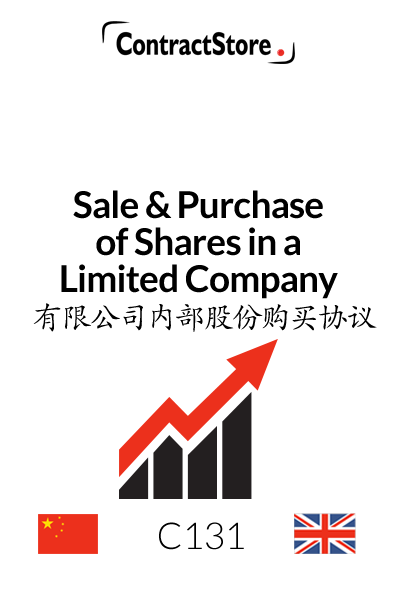 This Share Sale Agreement is in two languages – English & Chinese. 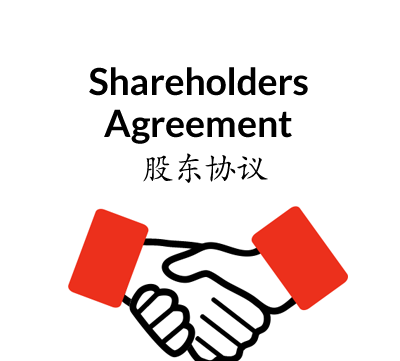 It is suitable for use where there are two shareholders in a company and one of them agrees to sell their shares to the other shareholder. 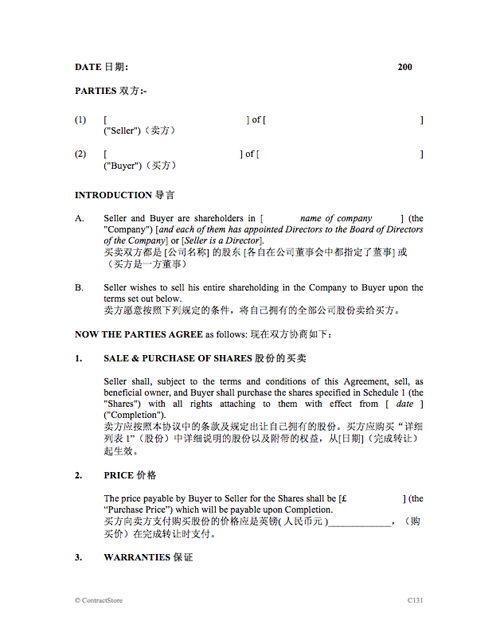 The contract is straightforward with seven clauses and is a dual language version of our English Share Sale Agreement, A131, adapted for use in China. 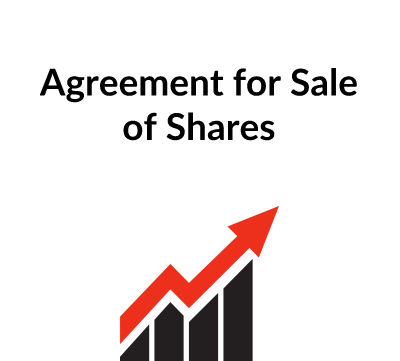 This agreement is designed for use where the two parties are the only shareholders in a company and one of them wishes to sell his/its holding to the other. In such circumstances where, as our agreement contemplates, both parties are represented on the board of the company and both of them are parties to a shareholders’ agreement, very little formality is required: both of them should already know about the company’s business without the buyer having to rely on ‘due diligence’. The main concern from the Buyer’s point of view is to ensure that the shares which he is acquiring are beneficially owned by the Seller and that no third party has any undisclosed interest in those shares. The Buyer will also want to be sure that the sale is only completed when the Seller’s directors resign (or the Seller resigns as director) from the board. This sets out the transaction and refers to a schedule which specifies the number of shares being transferred. This contains the price payable by Buyer to Seller and makes it clear that payment will be due on completion. This deals with the point made above: the Seller warrants to the Buyer that he is the beneficial owner of the shares and that the same situation will apply at completion. In the interim period, Clause 3.3 makes it clear that the Seller will not do anything to prejudice the business of the Company. Clause 3.4 provides for an optional indemnity to be given to Buyer by Seller in the event that Seller is in breach of the warranties in clause 3. This deals with the mechanics of the transaction – the completion date – i.e. the date when the shares will be transferred and resignation letters from Seller’s nominated directors (or, where Seller is a director, his resignation) will be handed over. Payment will also be made for the shares at this point (4.2). Clause 4.3 provides for payment of interest in the event that all or part of the purchase price is paid late. If part of the deal is that the Seller will not compete with the Company for a specified period after selling his shares, then clause 4.5 is recommended so as to be sure that he is legally obliged not to compete with the company for a specified period. It is in italics and these can be removed if it is to apply, otherwise the clause itself should be deleted. This clause sets out a number of standard “boiler plate” provisions. This clause specifies the ruling language of the Agreement – either English or Chinese in 6.1. 6.2 specifies the governing law – i.e. the law of the country that will be applied when interpreting the contract. 6.3 provides for the parties to try to resolve any dispute by direct negotiation. If this fails, the dispute will either be referred to the courts or to arbitration and we have alternative versions of 6.4, one of which should be deleted. If the courts are preferred to arbitration, the country to be selected will normally be the same as that in clause 6.2. If arbitration is chosen, the arbitral tribunal needs to be specified and we have suggested either CIETAC, China International Trade and Economic Commission, which is based in China or the LCIA, London Court of International Arbitration, which is in London. There is free information on our website concerning governing law and arbitration. If the Buyer and Seller are the two parties to a Shareholders’ Agreement, this clause will be applicable and the effect will be for the Shareholders’ Agreement to be terminated on completion.